"It's Not Right" is the first single from The Fifth Estate's 2011 TIME TUNNEL album of Intergalactic, Stellar, Big, Meaty Beaty, 60s-ish, but Modern Rock and Roll ! 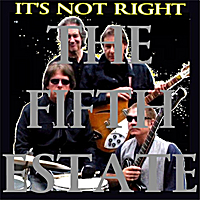 The Fifth Estate is a Gold Record, top of the Billboard Charts, rock and roll band, originally formed just outside of NYC in Stamford, Connecticut as The D-Men in early 1964. They played consistently through 1970 when they all went into independent projects. They have had a compilation album out in 1993 and a "Best Of" put out by Master Classics in 2011. Their new album, TIME TUNNEL, was recorded in 2010/11 and is due out on 11-11-11. It was produced with the assistance of and mixed by Shel Talmy, the original producer for The Kinks, The Who, The Easybeats, Manfred Mann, early Jimmy Page and David Bowie. In the early years (as The D-Men) the band played many small shows and local clubs, but soon gravitated to Greenwich Village and larger clubs where they often played six nights a week for long stretches. Early on, as The D-Men, they released three singles, two on Veep/United Artists and one on the Kapp labels, which along with much of their later material has become collectors' items and established them as a central part of the garage rock movement. Boston Skyline released a 28-song collection of their music in 1993 and published a 41-page booklet of their story. The band made a number of appearances on television, including Hullabaloo, on which they performed "I Just Don't Care". The program was at that time co-hosted by Brian Epstein, who expressed an interest in signing them. They later won a Murray the K call-in contest for best new release over The Dave Clark Five and The Animals in 1965. In 1966 they changed their name to "The Fifth Estate. The Fifth Estate released the single "Love Is All A Game" on the Red Bird label, which became a regional hit, and still receives airplay around the country as they again have become more highly regarded through their connection with the garage band revival and garage rock movements in general. They had a national/international hit in 1967 with "Ding-Dong! The Witch Is Dead" which reached #11 on the Hot 100, which they recorded and released around the world in five different languages (Japanese, Italian, French, German and English). According to Cashbox It is in the Top 100 record releases of 1967. For over 40 years it has been the biggest hit with the highest chart position of any Harold Arlen or Wizard of Oz song performed by any artist. Two other releases skimmed the bottom of the charts, although not making an impact in America, although in 1968 their own "Morning Morning" was a sizable hit in Australia. The original five member band lineup was consistent for six years. In that time they recorded about 100 songs, and released 13 singles and one album. Sam and Dave joined them on stage and sang "Soul Man" with them at one of their theater shows, while one of the Vandellas sang and recorded one of their tunes with them as her next release. They also appeared in a 1967 TV episode of Malibu U, with weird overlays and film footage. The Monkees covered The Fifth Estate's version of "Ding Dong! The Witch Is Dead" on episode 58 of their TV show in 1968, "The Frodis Caper". The Fifth Estate also toured with acts such as The Lovin' Spoonful, The Turtles, The Byrds, The Easybeats, Count Five, The Electric Prunes, The Music Explosion, The Buckinghams, The Ronettes, Gene Pitney. They also did the Upbeat TV program with another Greenwich Village band, The Velvet Underground. In 1970 they all went off on different projects, but have since reformed and continue to perform and record. In 1969, two unauthorized singles were released under the band name and without their participation. Other albums of early unreleased material due out in 2012.